These lovely Suzanne Stripe M valances by Ellis Curtains are crafted in the U.S. of a machine washable cotton blend duck fabric. 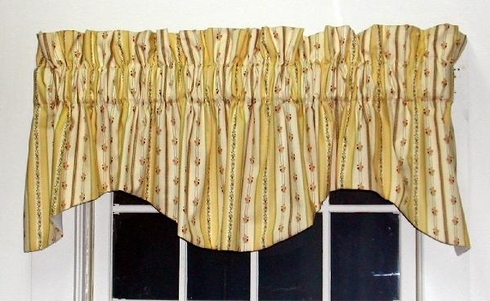 The design on this window valance now on sale at The Curtain Shop is a two-tone vertical stripe pattern in brick yellow and beige with a vertical flower pattern. The width is a generous 70 inches, and the length is 15 inches. The 3-inch rod pocket can accommodate a 2 1/2-inch curtain rod. The 3-inch header creates a pretty ruffled effect on top.